Study the histories of the visual arts which include photography, sculpture, painting, architecture, video, performances, installation, film, and digital imaging, among other media. Note: This program is under review. No students will be admitted for the 2018/2019 year. 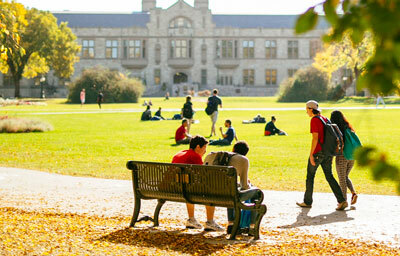 In addition to studying more traditional art history such as Renaissance and Baroque art you will be exposed to such areas as First People's Art History; Postcolonial Issues in Contemporary Canadian Art; Art of the Internet; Contemporary Performance Art Theory and Praxis; and Studies in Visual Culture. You will learn how visual forms from painting to film to the Internet and popular media, produce meaning in contemporary everyday life. An introduction to the architecture of the European states and their colonies 1400 to 1700. The institutional, geographic and social locations of architectural production will be studied. Issues of power, nationalism, and class will be examined. Artistic trends in the second half of the 16th century will be considered in the context of the Council of Trent; special emphasis will be placed upon Late Titian, Tintoretto, Veronese, and the painters of the Medicean Studiolo. A survey of contemporary international art which includes film, video, performance, as well as more traditional media. You can take advantage of our unique study abroad opportunities and sign up for international art courses in Europe or Japan. You will be prepared for rewarding careers in both traditional and modern fields of art and art history.